If the framed handkerchief post didn’t already make it obvious, I’ve been digging through our belongings and finding “art” through a fresh pair of eyes lately. I expect that has something to do with the amount of time we’ve been in our apartment – it’s been long enough that I’m A) no longer just repeating what we had in our old house, B) able to see this place as “home”, and C) tired of having things still packed away from the move. Wait, what? Things still packed away from the move? Didn’t I unpack ALL hundred-plus boxes within one week of moving in? Yes indeed. But what I didn’t do was take those items that were more haphazardly packed and sort them into a place that made sense. 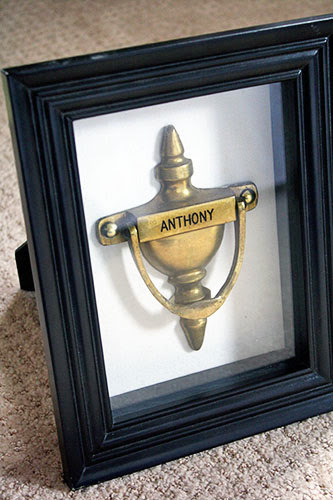 Which is why I had an old engraved family doorknocker in my craft supply drawer for the last year and a half. 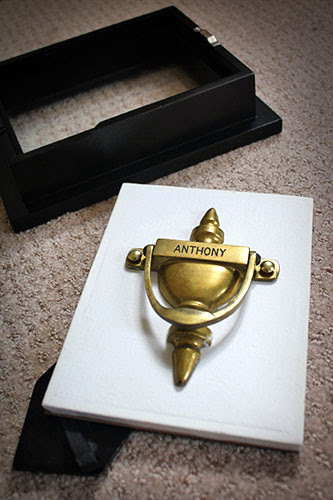 Why was a doorknocker stashed in my craft drawer, amidst the hot glue gun and paper cutter? Your guess is as good as mine. Having things in the wrong place is even worse than not having them at all, because you can’t find them and don’t use them, yet they take up space. Better to get them out and make some meaningful art! 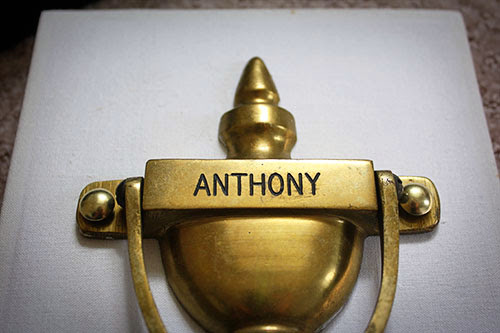 The doorknocker is engraved with my family’s name (prior to my joining Team P), but I honestly don’t remember ever using it on our door. Still, it’s pretty delightful, if not kitschy, art when stuck in a shadowbox. Speaking of the shadowbox, I found it at Target years ago. It was also unused prior to the move and shoved in a cabinet after the move, generally annoying me by TAKING UP SPACE. I’m happy to use it here, because it was totally perfect for this project! 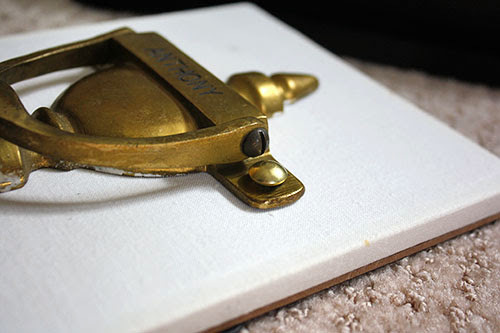 The key to making this project work, though, was finding a way to attach the doorknocker to the thick foam shadowbox backing. It all came together when I realized I could use the leftover nails from the DIY nailhead trim bulletin board! They’re a bit too long to push them in flush with the doorknocker, but it seems secure enough, and it’s not obvious that they’re sticking out unless you look closely. And anyway, I just used yet another item that’s shoved in a drawer, which means it’s automatically a success in my book. Clearing out drawers AND getting “new” meaningful art for FREE? These are a few of my favorite things. I’m absolutely giddy over it. The black and gold. The family name! 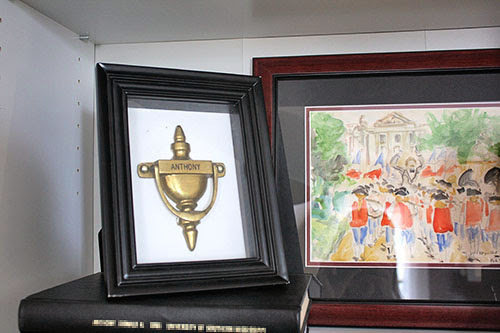 Right now it’s on the shelf with the watercolor of my dad (Dr. Anthony himself), and sitting on top of the doctoral dissertations that my dad and I wrote. Which are also black and gold. This was meant to be, you guys. Love the arrangement/display you have created with these items. Strong work.